Make a very special romantic card, for your very special loved one! Use amazing Background, designer Elements, write Text and add a fantastic border. We bring you a wide range of collection in different categories and theme, there are plenty for everybody. You can also customize with a picture from your library or take a photo to make a Card. Send the card to your loved one with facebook, twitter and email. For the romantic music lovers we have thousands of love ringtones. 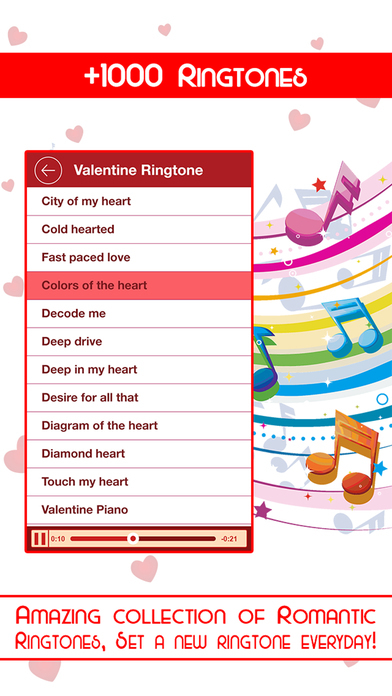 Choose from 1000+ romantic ringtones, and get your groove of love! For the ones who love old fashioned SMS, this App has an amazing collection of love SMS. Send as many as you like to say that you care! And for those who await Valentine’s Day all year long, enjoy the Valentine’s Day Countdown! Now count to Valentine’s Day with this amazing App, you won’t need a calendar no more! 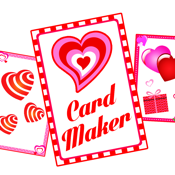 - Different categories, themes and styles of Card backgrounds. There are plenty for everyone! - You can also use photos from your library or take a photo to make a Card! - Send the Card with fb, twitter & email. Make it personal and send it to your loved one! 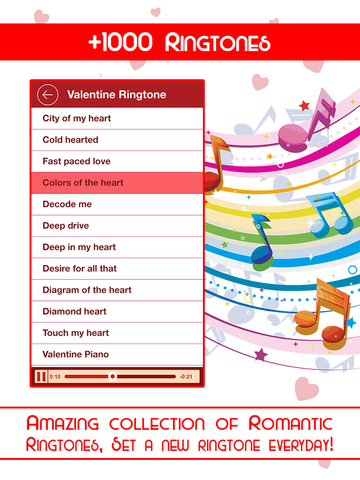 - Set a romantic tune as your ringtone, celebrate love with soothing music! - Send romantic SMS to your love! Amazing collection of personal & lovely greetings. - Appropriate for all ages, variety of options! - Sparkling color, easy to use, no fuss, just the right thing for you!